Geography has been a surprisingly easy subject to teach. Peter loves maps, and providing him with the opportunity to see them has been all of the encouragement he has needed. We found a very colorful world map that we put above the changing table where he can see it often. 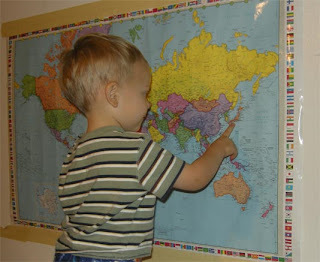 I ask him which countries he likes, and he points to a country. I’ll say "That's Russia, isn't it?" Then I’ll tell him “I like the United States, that’s where we live”. There are some countries he consistently points to, and I admit I've tested him on those a few times, but he loves those tests because he knows the answer. From this simple exercise, he knows where the United States, Canada, Russia, Japan, Australia, India, Greenland, and Madagascar are (at least).Another thing that has worked for us is we have a puzzle of the United States, and what better place to learn shapes than a hands on puzzle? Of course, that's if your kids love puzzles, which Peter does, so now I have a soft spot for puzzles when we go shopping. Also, he has a book he loves, "Puff the Magic Dragon", that has a map of Honalee at the beginning, and from this map he has learned to recognize things like volcano, harbor, river, mountain, lake, and island. I plan on teaching him peninsula, desert, forest, and a few others from this map too, but haven't gotten that far yet. I figure if I'm going to read a fictional book to him several times a day, I might as well get some educational mileage out of it! These Animaniac videos may help you teach geography. The Nations of the World is a little out-dated and was written more for entertainment than to be all-inclusive, but is still helpful. I took the effort to learn both of these songs, and my husband was glad when I did because I stopped singing them 24/7! My son likes the videos and I hope they will be useful to him someday.